Heroin and prescription opioid pain relievers both belong to the opioid class of drugs, and their euphoric effects are produced by their binding with mu opioid receptors in the brain. 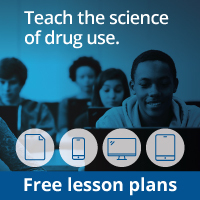 Different opioid drugs have different effects that are determined by the way they are taken and by the timing and duration of their activity at mu opioid receptors. 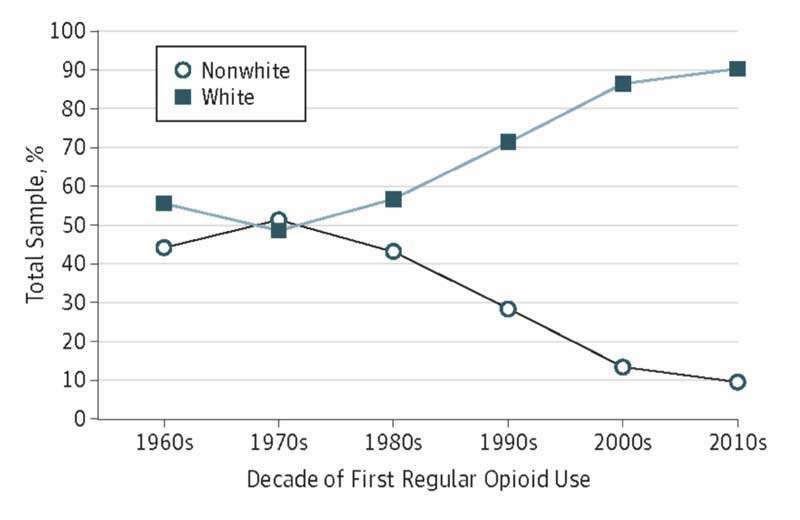 People who began using heroin in the 1960s were predominantly young men from minority groups living in urban areas (82.8 percent; mean age at first opioid use, 16.5 years) whose first opioid of abuse was heroin (80 percent). 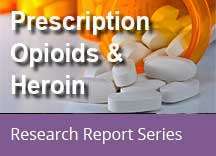 The epidemic of prescription opioid abuse has been associated with a shifting of the demographic of opioid users toward a population that is somewhat older (mean age at first opioid use, 22.9 years), less minority, more rural/suburban, with few gender differences among those who were introduced to opioids through prescription drugs. Whites and nonwhites were equally represented in those initiating use prior to the 1980s, but nearly 90 percent of respondents who began use in the last decade were white (Cicero et al., 2014). Racial distribution of respondents expressed as percentage of the total sample of heroin users. Data are plotted as a function of decade in which respondents initiated their opioid abuse. Source: Cicero et al. 2014. Because heroin is often injected, the upsurge in use also has implications for HIV, hepatitis C (HCV), and other injection-related illnesses. Recent studies suggest that having used opioid pain relievers before transitioning to heroin injection is a common trajectory for young injection drug users with HCV infection (Klevens et al., 2012). A study of new HCV infections in Massachusetts found that 95 percent of interview respondents used prescription opioids before initiating heroin (Church et al., 2010). Church D, Barton K, Elson F, DeMaria A, et al. Notes from the field: risk factors for hepatitis C virus infections among young adults – Massachusetts, 2010. Morbidity and Mortality Weekly Report (MMWR). Atlanta, GA: Centers for Disease Control and Prevention; 2011. Klevens RM, Hu DJ, Jiles R, Holmberg SD. Evolving epidemiology of hepatitis C virus in the United States. Clin Infect Dis. 2012;55(S1):S3-S9.